The Death Head Moth, also called the Death’s-head Hawkmoth, is a genus of moths with three species falling under them. With almost the same characteristic features, this group of well-known moths gets their common name ‘death head’ from the unusual skull pattern or patch at the dorsal side of their thorax. They are also a favorite subject of taxidermy, as well as in the pet trade market around the world. Size: Wingspan length ranges from 5 to 20 cm (2 to 8 inches). Body & Wings: The body is stout with a bullet-like shape, with two long, narrow forewings and two shorter hindwings. Fur/hair: The entire body is covered with fine velvety coat. Feet: Three pairs of hardy, clawed feet. Eyes: Possess compound eyes like most other flying arthropod species. The eyes are shiny and black. 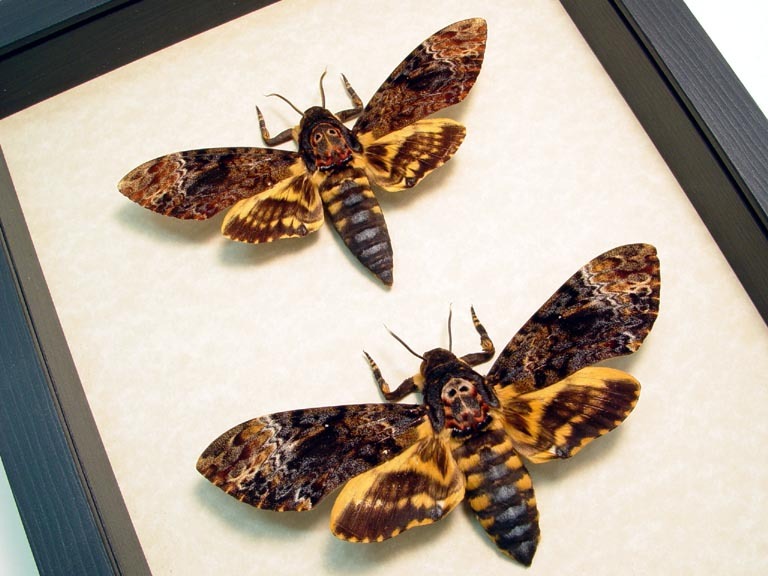 The adult death head moths can live for up to 6 weeks. The European species is unable to survive winters in the UK. 3. The Acherontia lachesis (common name: Greater death’s head hawkmoth) – also found in Asia. Death head moths are most commonly found in gardens, allotments, and organic potato fields. 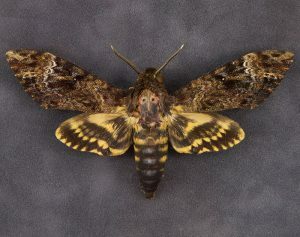 Death head moths are nocturnal and are mostly seen in light traps or beehives in search of honey. These creatures pollinate flowers like several petunia and orchid species while sucking nectar from their flowers. When they gather nectar, they can hover over the flower like hummingbirds. All the species of these arthropods have been studied raiding beehives made by several honeybee species for ‘stealing’ honey. However, the A. atropos species attack hives of the Apis mellifera, commonly known as the western honey bee. When provoked or irritated, the members of all the three species emit a shrill chirping noise. Though, this is not an oral call but is rather produced by inhaling and expelling air that vibrates their epipharynx. The squeak lasts for about one-fifth of a second. The adult death head moths primarily live on nectar from flowers, as also, honey that they retrieve from beehives. The primary host plants of the caterpillars are potato, deadly nightshade, and a few other Solanaceae, as well as Verbenaceae, Oleaceae, Bignoniaceae, and others. 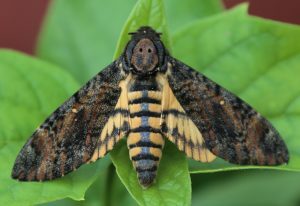 After a successful mating of between the male and the female death head moths, the latter lay eggs singly under old leaves of some host plant. The eggs are green or grey-blue. 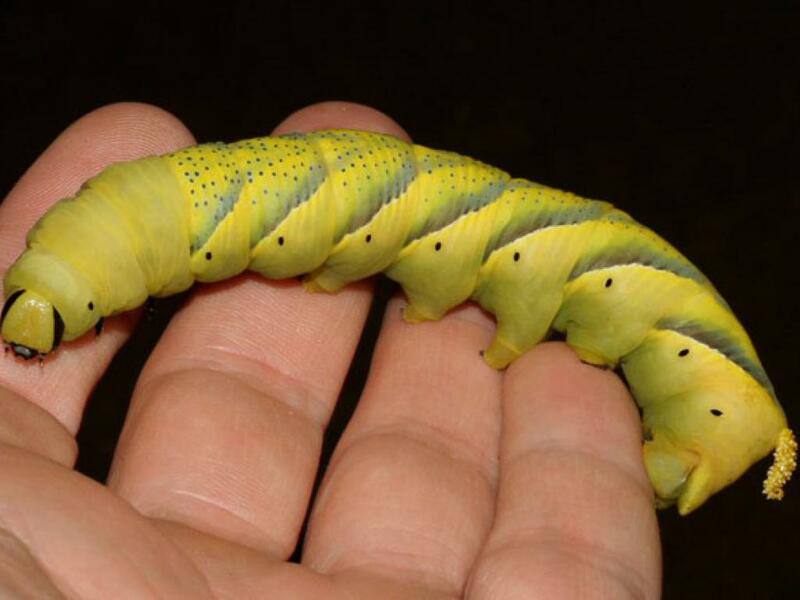 The larva (caterpillar) of the death head moth is hardy with a length of around 120 to 130 mm. They have a distinct tail horn. The larvae of the three species have three typical color forms – green, brown, and yellow. There is less movement in the worms. The insects would click their mandibles and would even give a bite if threatened. 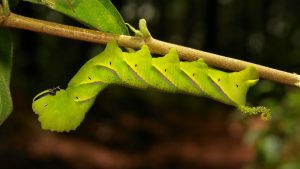 When they are grown entirely after around 3 to 5 weeks, they dig burrows underground, excavating a small chamber where they metamorphose as a pupa and hang from the ceiling in the cocoon between August and October. The pupal stage lasts for about three weeks. A study conducted by the National Geographic concluded that the epipharynx in these insects initially developed for sucking up honey or nectar, but was later modified to produce sound. They mimic the scent of the bees that help them raid bee hives without being disturbed. The thick cuticle on the body acts as a shield to prevent the bees from stinging them. 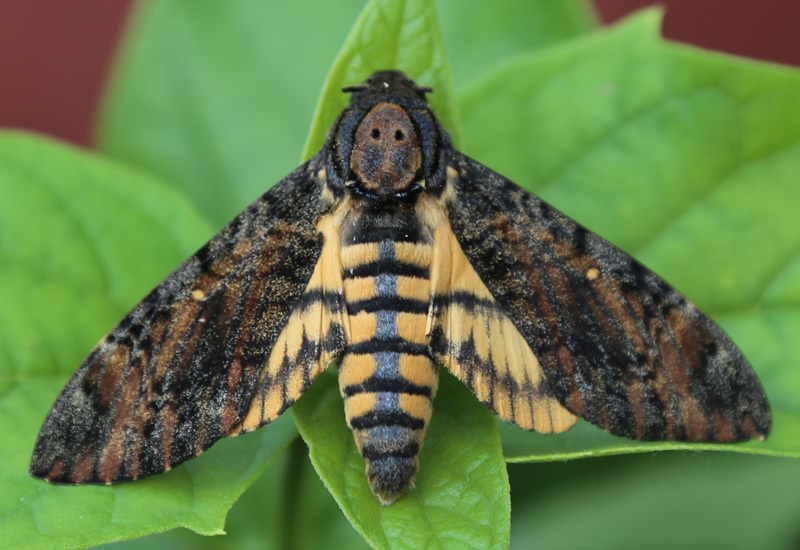 It is hypothesized that the death head moths have partial resistance to bee venom. These insects have clawed feet that assist them in climbing around the beehives easily. The short proboscis present near their mouths is adapted for piercing through the honeycombs. Their tendency of flashing the brightly-colored abdomen is a behavioral adaptation to deter predators. The color patterns of their wings are enough to keep them camouflaged in the woods. 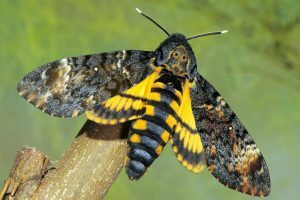 The primary enemies of these moths are birds, amphibians like toads and frogs, spiders, lizards and other local reptile species. The creatures have been associated with many mythologies and symbolism, and with the supernatural, or evil omen, eventually leading to a growing number of superstitions surrounding them. As the meaning of their name suggests, it is generally thought that the moth summons bad luck to the house into which it flies, including grave misfortune and even death. 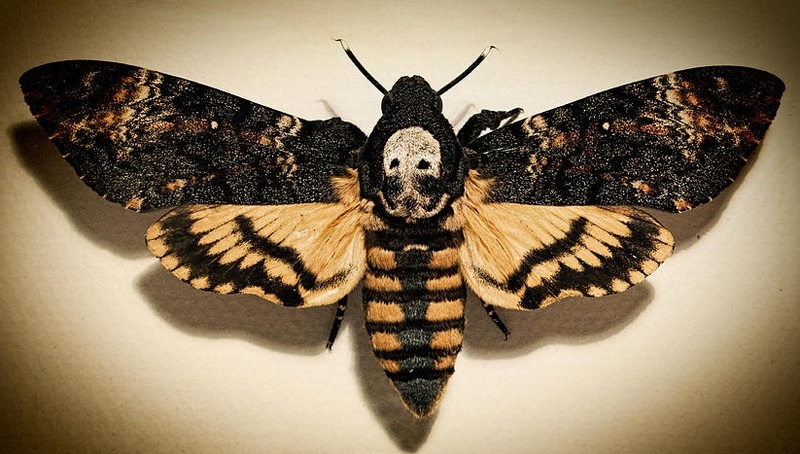 The death head moth has made its place in numerous fields of art and fiction. It includes William Holman Hunt’s masterpiece The Hireling Shepherd, in literature like Bram Stoker’s Dracula, Thomas Hardy’s The Return of the Native, Susan Hill’s gothic horror novel I’m the King of the Castle, John Keats’ Ode to Melancholy, and in timeless Hollywood classics like ‘The Silence of the Lambs’ (promotional marquee posters), and many more. In 1801, during his second major incident of madness, two large death head moths were discovered in the bedchamber of King George III of the United Kingdom. One of these was collected by the king’s physician, Robert Darling Willis, which is now stored at the University of Cambridge. These moths are not poisonous to humans unless someone consumes them. 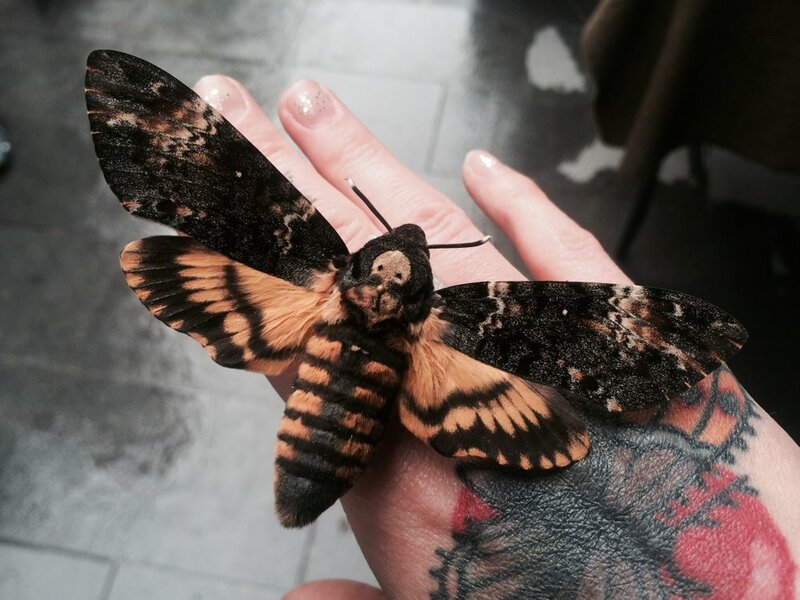 The death head moth is a favorite body tattoo theme, while the dead/preserved/framed specimens are also popular sale items in the electronic commerce companies like eBay. By speed, the species Acherontia atropos is the fastest moth in the world and can fly at a speed of up to 30 mph.